The College Park Community Foundation (CPCF) and Terrapin Development Company (TDC) are pleased to announce a multi-year partnership to support building the strength and capacity of College Park’s nonprofit community. TDC will sponsor CPCF’s signature annual event, the Awards Gala, for three years, committing a total of $19,000 over three years. Since its founding in 2012, the College Park Community Foundation has awarded $52,800 in grants to nonprofits working in three priority areas: education, quality of life, and community building. The Foundation made its first awards in 2013 with just $1,328.97 in grants awarded. Thanks to the entrepreneurial spirit of the all-volunteer organization and the generosity of College Park residents and businesses, CPCF saw steady growth in its awards, announcing $16,380 in grants for 2018. 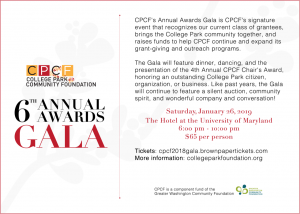 Each year, CPCF celebrates the philanthropic spirit of the College Park community at the annual Awards Gala, and includes the Chair’s Award, which is given to a College Park resident, business, or organization that exemplifies service to the community. “Having Terrapin Development Company as a signature sponsor is very exciting for CPCF. We are thrilled to see their commitment to philanthropy in the College Park community,” said Nick Brennan, co-chair of the Foundation. The sponsorship includes $9,000 in matching funds, designed to encourage other gala attendees to contribute generously to the Foundation’s mission. “Since their inception, the College Park Community Foundation has worked tirelessly to support charitable community organizations in the greater College Park area. Their support has enabled numerous groups to expand their work in the community and bring together the residents, businesses and students that call College Park home. Terrapin Development Company strongly supports the mission of CPCF, and is proud to partner with them to continue to serve the College Park community,” said Ken Ulman, President of Terrapin Development Company. The Awards Gala is January 26, 2019 at 6:00pm at the Hotel at UMD. Tickets are available at https://cpcf2018gala.brownpapertickets.com.